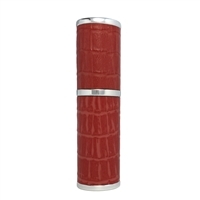 Silver and ruby scarlet red imitation crocodile skin refillable perfume atomiser. Beautifully made to the highest standards in Austria this piece is delivered gift boxed. A gilded spray nozzle and collar finish this lovely atomiser beautifully. Exclusive gift set of sterling silver perfume atomiser, sterling silver handbag mirror and black leather make up bag. Gift boxed and ribboned. 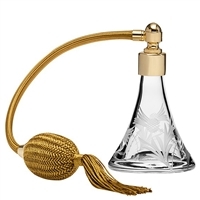 24% lead crystal perfume bottle with atomiser. Cream atomiser with round London design bottle by Royal Scot Crystal. 24% lead crystal perfume bottle with atomiser. Cream atomiser with round Daffodils design bottle by Royal Scot Crystal. 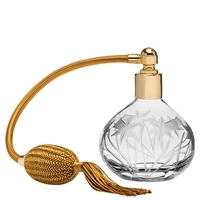 24% lead crystal hand cut round perfume bottle with gold atomiser. Annabel design by Royal Scot Crystal. 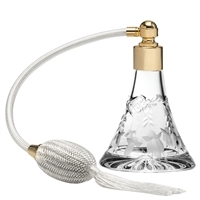 24% lead crystal hand cut tall conical perfume bottle with cream atomiser. Annabel design by Royal Scot Crystal. 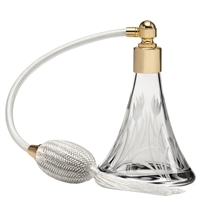 24% lead crystal hand cut round perfume bottle with gold atomiser puffer. Daisy design by Royal Scot Crystal. 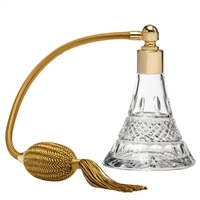 24% lead crystal hand cut tall conical perfume bottle with gold atomiser puffer. Regency design by Royal Scot Crystal. 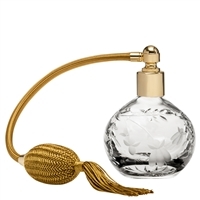 24% lead crystal hand cut round perfume bottle with gold atomiser puffer. Daffodil design by Royal Scot Crystal. 24% lead crystal hand cut tall conical perfume bottle with cream atomiser puffer. Flower of Scotland Thistle design by Royal Scot Crystal. 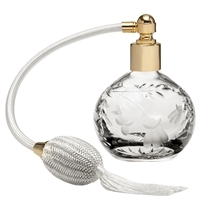 24% lead crystal hand cut round perfume bottle with black atomiser puffer. Annabel design by Royal Scot Crystal. 24% lead crystal hand cut round perfume bottle with black atomiser puffer. Regency design by Royal Scot Crystal. 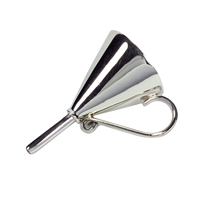 24% lead crystal hand cut tall conical perfume bottle with cream atomiser puffer. Meadow flowers design by Royal Scot Crystal. 24% lead crystal hand cut tall conical perfume bottle with black atomiser puffer. Regency design by Royal Scot Crystal. 24% lead crystal hand cut tall conical perfume bottle with cream atomiser puffer. Wild Tulip design by Royal Scot Crystal. 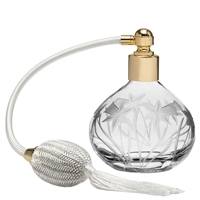 24% lead crystal hand cut round perfume bottle with gold atomiser puffer. Sweet Pea design by Royal Scot Crystal. 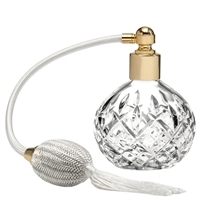 24% lead crystal hand cut round perfume bottle with cream atomiser puffer. Annabel design by Royal Scot Crystal. 24% lead crystal hand cut round perfume bottle with cream atomiser puffer. Laurel design by Royal Scot Crystal. Silver and black imitation crocodile skin refillable perfume atomiser. Beautifully made to the highest standards in Austria this piece is delivered gift boxed. Roses design cosmetic make up purse bag with silver plated love heart compact handbag mirror and ruby red crocodile effect refillable perfume atomiser. Gift boxed. Rose gold sequinned cosmetic purse with refillable pink perfume atomiser and gold plated and enamel handbag compact mirror. Silver sequinned cosmetic purse with refillable silver grey perfume atomiser and enamelled handbag compact mirror with Swarovski crystal Champagne flute. Red leather cosmetic purse with black and red enamelled compact mirror with Swarovski crystals and refillable perfume atomiser. Gift boxed and ribboned.